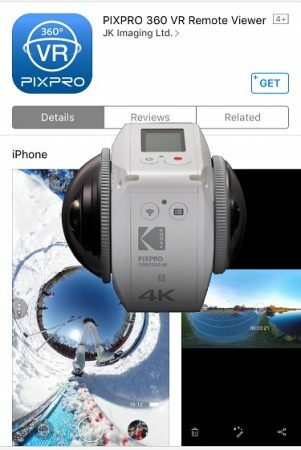 Kodak PIXPRO’s highly anticipated Orbit360 (also called 4KVR360) hasn’t been released yet but Kodak has already released the phone app for both iOS and Android. It’s called PIXPRO 360 VR Remote Viewer. Here it is on Android and here is the link for iOS. You can connect to KODAK PIXPRO ORBIT360 4K (or KODAK PIXPRO 4KVR360) via this APP, realizing the functions of shooting, recording, changing the shooting parameters, playback and editing the moving images easily. For iOS, the minimum requirement appears to be an iPhone 5S. The Google Play Store doesn’t specify what the requirements are for Android. A screenshot from the app seems to show that it has a self-timer feature (finally! ), a function which had been missing from the Kodak SP360 4K Dual Pro. Another screen shot shows that the app has a simple video editor that will enable you to trim videos (note the icon of the Orbit360). Thanks to tech vlogger Pepe Vazquez for bringing this to my attention! You can check out Pepe’s YouTube channel here where he posts many 360-related videos.